China has a long history and is rich in natural beauty, ancient culture and exciting cities to visit. You can see magnificent mountains and rivers, interesting animals and plants, numerous historical sites, traditional Chinese opera, music and dance, and architecture ranging from classical Chinese to late 19th and early 20th century Russian to post-modern skyscrapers. And then there are China’s many different cuisines! So, to make traveling in China easier, here are some helpful phrases. Where is the metro/taxi station? Dìtiě zhàn/dí shì zhàn zài nǎ’er? How much is it? Zhège duōshǎo qián? It’s too expensive! Tài guìle! Can you make it cheaper? Néng piányí diǎn ma? When we are in a new place, especially in a foreign country, it is easy to become confused. If you can ask for help from others in Chinese, people will admire you. （Nǐ hǎo）is commonly used in greetings. 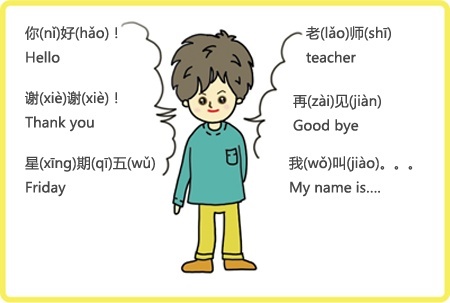 It can be taken as “hello/hi.” Although most Chinese people understand the English “hello/hi” and can reply in the same way to you, they appreciate hearing it Chinese. Could you please tell me where Happy Valley is? We have taken the Shenzhen amusement park Happy Valley as an example. However, when you need directions you can ask someone for help by using this structure: Qǐngwèn [name of the place] zài nǎlǐ? The literal translation is as follows – and note the different sentence structure from English: Excuse me, Happy Valley, where is it? In most historic places and cultural sites you will need a ticket to enter. Being able to arrange a hotel room brings a sense of comfort! I need a single room/double room. Where is the metro/taxi station? Metro and taxi are the most common forms of transportation in cities. I need go to the airport. It is important to know how to say this to a taxi driver! You may buy a gift or souvenir, so learn to ask the price. But Chinese expect to bargain, so be prepared. 12. 不用谢! (Bùyòng xiè ) You are welcome. I am American; I am Bristish Man; I am German. Most Chinese, however, know “bye bye” and use it frequently.